Formation Combat: Relevant or Redundant? 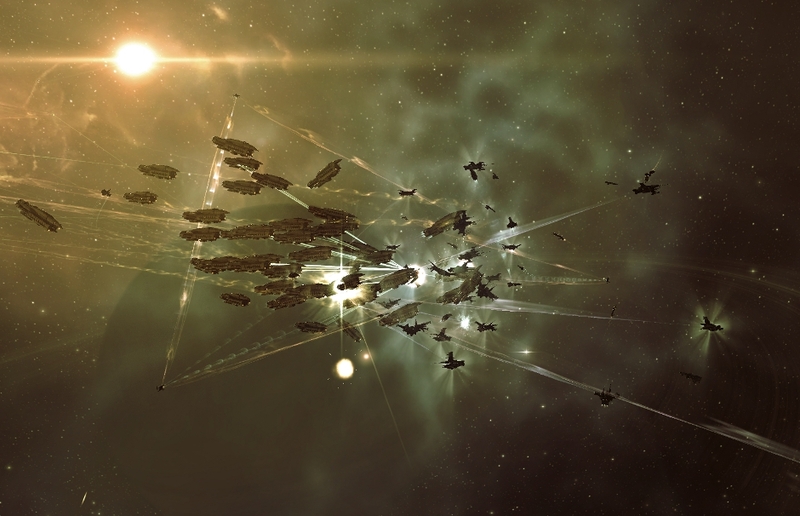 Combat is central to much of EVE’s gameplay, from simple 1v1s to massive blob(fleet) clashes. Despite the depth of preparation options in ship fitting and fleet composition, the engagements themselves play out in a fairly predictable way. A target is selected and pilots scramble to achieve their optimal weapon ranges to settle into an orbit and achieve the highest speed possible to reduce incoming fire. Of course there are other subtleties to consider, especially in multiple ship engagements, but that is the basic essence. I’ve just been having an engaging and thought-provoking Twitter conversation involving @Mandrill, @SpaceKazz, @CCP_Sisyphus, @ktouborg (CCP Soundwave), @DrVerikan and others, but the limitations of 140 characters was making the discussion difficult. Would some kind of formation mechanic add any depth to the combat experience? Personally, I’m not convinced that preset formations would be of value, however what about the simple introduction of a ‘match speed and direction of target’ option? We already have a ‘keep at range’ option, but this simply makes the ship attempt to move directly away from the target then perform all kinds of ridiculous and unsafe manoeuvers at slows speeds to maintain the distance. As a result, it is pretty useless. If the ability to match speed and heading to a friendly or enemy target were available, how might this impact on existing gameplay options? If the mechanic was kept simple and the onus was on the pilot to reach the appropriate range before hitting the button, pilot skill and situational awareness and knowledge would still be a key factor. The decision remains with the pilot on what distance would be of use, but once that had been achieved, the ability to shadow another ship in this manner may have applications. A blob is so-called because it is a disorganised collection of ships, fleeted together but arranged pretty much at random in a spherical formation. Being able to match speed and direction could give rise to more thoughtfully arranged blobs with central or back-line sniping ships, outlying tacklers, vulnerable ships placed appropriately before an engagement begins. It would be key that the formation holds together through warp, but it would allow a more tactical spread of ship types to be able to execute an attack plan with a “playbook formation”. Of course, once the combat itself begins, all hell will break loose and the individual pilots will have to respond accordingly. This could give rise to American Football style set plays, all laid out the moment a fleet comes out of warp, with ready-placed bait ships, micro-jump drive enabled frontline squads, well-placed sniping support and other subtleties. Being able to match speed and heading to the FC could make fleet movement more user friendly. It would provide an alternative way of aligning a fleet to the next jump point. Once a fleet pilot has jumped through a stargate, he could manually align to the designated destination, or align with the FC. The speed matching would prevent faster ships from straying too far from the fleet. Of course, if the FC is in a rapid vessel, he would need to consider slower fleet members. A distant target is only an icon on the screen and an entry in the overview. Without CCP T0rfiFrans’ promised picture-in-picture functionality, it is difficult to determine what the target might be up to unless you want to decipher the transversal and velocity data in the overview columns. Having a pilot in fleet who is mirroring the target’s behaviour might give early warning to his intentions. In conclusion, could such a mechanic provide any additional depth to the build-up to an engagement, or even to the combat itself? Is there an application for manual formations enabled by a ‘match speed and alignment’ function? Or does it “make EVE too easy” as some have suggested? There are undoubtedly other applications that players might exploit. Visual wise for screenshots and video formations would be awesome. At a POS bash this week we used the FC as anchor. Eve looks a little "silly" when 20 BS are trying to keep a single BS at 1000m range. Something I've been thinking about lately as well. But how about a formation tactic that increases something about those in the formation? Like four Rifters that combined have more dps say, than they would individually? I haven't thought it all the way thru, mostly because other things keep getting in the way. But there is something there I think. Is it mod based? Kind of like a "web" that each ship shares? Dunno. Certainly like this idea, but I think that there needs to be as much of a tactical reason for adding formations as anything. 2) Bonuses work as a linked chain. Fleet Commanders pass their bonuses on to Wing Commanders. Wing Commanders pass these bonuses (and theirs) on to Squad Commanders. Squad Commanders then pass all bonuses on to all squad members. 3) Formations exist on the squad level to allow for squad members to stay within optimal range of their bonus providing Squad Leader. (Wing Commanders are in essence a squad under the Fleet Commander). This creates an even deeper tactical element to the battle where certain ships within the chain must be protected. Tighter formations get better bonuses, but are more susceptible to bombing, etc. Also, reorganisation during the battle becomes a crucial skill. Could one FC handle all of this? Probably not. Potentially this leads to greater levels of delegation? Less of the 'everyone primary target X'? More command related roles on the battlefield? Pipedream? I've enjoyed this debate on Twitter today but I think ultimately there is no need for it (though it would look purdy). A large fleet may look like a big blob of mess but that doesn't mean it isn't organised. We already have keep at range and use coms to discuss setting range/speed too. Someone (I think @mandril) was talking about introducing line of sight, which would of course change things and might make formation something to consider – but in a large fleet or with multiple fleets of friends and enemies on the field… hell I just don't see how that would work at all? But imo whilst there is no concern with ships bumping into each other then formations are not really needed. As for bonuses, I again I don't really think it would work. Basically you are saying that if you are in a fleet of X you get no bonus. If you are in a fleet of X and flying in a specific layout then you get the bonus. Seems pointless, no? Of course if CCP changed the game so you could only hit what you can "see" and change ships so that bumping explodes your ship then, well I'd be screwed, I fly like an old lady drives. The only reason to add formations is because it is pretty, which is not good enough, says CCP Soundwave. There is nothing wrong with this, why else do we have nebulas and other shiny things today ? Even if no tactical content is connected to formations it would still make EVE fleet combat so much prettier. And prettier means prettier player videos which means more subscriptions. I particularly like the suggestions that bonus ships must be in formation with the bonus giving ship. This immediately solved the problems of (A) off grid boosters and (B) why people would bother using formations. I think a formation would be great if I could find cover behind my fleet mates. But the enemy can shoot through all of them like I can fly through planets. So the only reason to add formations is because it is pretty. But I think it would be prettier if solid matter actually would stop projectiles from hitting me. Just think about how this would change the game. Wait, what? Can you say “Total.” “Game.” “Changer.”? The sheer, mind-blowing implications of combat scenarios involving cover and collisions are absolutely immense. Imagine being able to weave through an asteroid belt to avoid incoming fire, or position ships tactically within a fleet to protect the more fragile vessels, or have a ship dedicated to ramming through those very defensive lines to leave the central target exposed to your damage-dealing fleet-mates. There would be an explosion of new fleet doctrines and tactics and undoubtedly a whole new brand of griefing. It would be glorious, hilarious and tragic in equal measure – the stuff of future legend." I was also thinking along the lines of a football playbook. But as a tool for the FC. When everyone undocks the FC should be able to put beacons in 3D space, not only on a plane. Saying, "I want the brawlers there, fast tackle there, bublers there and logistics there." Everyone should then be in the appropriate wing and be able to see their beacon on their HUD and move there. When they warp to the fight this formation should be kept. And once there the FC should be able to move the beacons, saying "Brawlers align to this beacon, bublers go there and fast tackle go around there." What would be the absolute greatest solution would be if the FC could do this from a battle room in the captains quarters.